With the synth that leads us into “August Price” and the basic guitar riff, it fills the air with a dark, and sludgy form of Doom metal. With the change of rhythm, especially in “August Price” which changes from the slow gothic opening, to a “hold your lighter in the air” Doom build up, to a brutal verse, with heavy fast paced guitars and drums, and brutal growls from Chris G. Just when you think it’s going to get faster, the Doom returns and brings an even better rendition of the opening 30 seconds, but with more growls, and a lot more doom. There is a constant relationship between the beauty of the synth, and the brutality of the guitar, and during songs such as “Starless” when we get a mix of growls and deep clean vocals, it creates a Viking funeral march kind of Doom. However, I couldn’t hear the bass very well. Whether that’s just me, or because the bass just isn’t very noticeable, I don’t know. However judging by the brief amounts of base I could hear in “Nibelheim” the bass provides an additional boost to the heaviness of the instruments, whilst the synth plays almost operatic organ sounds over the top. The vocals during “Nibelheim” show how deep Chris G can actually sing. With the final song on the album “Beneath the Cover of Night” we get Doom, but in a more positive sounding way. The guitar, synth, and vocals are all in a major key, and whilst they have been playing a more Gothic tone for the most of this album, this new positive sound doesn’t drop any of the heavy. If anything, to me it sounds heavier. The band cite MY DYING BRIDE and SEPTIC FLESH as two of their influences, and you can definitely see those influences. The vocals sound very similar to the early SEPTIC FLESH, where as the guitars and the synth sound influenced by MY DYING BRIDE in the latter 2009 onwards albums. Whilst listening to "Revenant", it helps to keep reminding yourself, this is ORPHANS OF DUSK’s debut EP, and that there’s more yet to come in the following years. 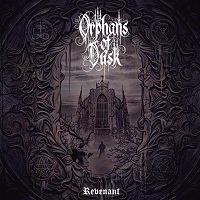 "Revenant" has got the buildings of a great Gothic/Doom metal album. However, the bass isn’t very noticeable, and that marks it down a notch for me. It is still a great debut EP from ORPHANS OF DUSK and I shall be expecting great thing from them in the future.